The Samsung SCX4725FN is all in one multifunction laser printer that can print, scan, fax and copy documents. The printer is compact in size with dimensions of 43.68 cm (width) x 37.33 cm (depth) and 38.60 cm (height). This printer is lightweight with a weight of 11.20 kg and can be lifted and moved. A two-line display is provided to monitor the print jobs. The printer features an Ethernet connection or a USB cord for connectivity. The printer is compatible with Windows, Linux or Apple Mac OS X. The Samsung SCX4725FN Toner Cartridge is highly efficient as it can produce up to 3,000 pages before the need to be changed. The printer has a clear print resolution of up to 1,200 x 1,200 dpi. This laser monochrome machine can have print speeds of up to 24 ppm and the copying speed of printer is 24 impressions per minute. A CIS scan element is provided for scanning with resolution up to 4,800 x 4,800 dpi. 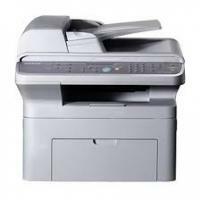 Its fax machine is G3 compatible and transmissions speeds can reach up to 33.6 Kbps. The fax machine has a total memory capacity of 320 pages. The Samsung SCX4725FN is a cheap printer that can perform all the basic tasks very well. The print quality is adequate. So it is a fine choice for everyday tasks. Q. I’ve ordered Samsung SCX4725FN toner cartridges from your site. Is it necessary that I must be present at the time of delivery? A. Your signature might be required at the time of delivery for the Samsung SCX4725FN toner cartridges. However, while making an order through our website you are authorizing us to accept signature from another person on your behalf if the order needs to be signed for and you are not present at the time of delivery. Q. While buying original Samsung SCX4725FN toner cartridges, each time the toner replacement, costs me much. Please suggest me some low cost toner cartridges under my budget, that can provide good quality prints. A. We would recommend you to buy compatible Samsung SCX4725FN toner cartridges for your printer. The difference between compatible and the original ones is the difference in cost. The compatible toner cartridges will save upto 50% of your money, as compared to the original ones. Also, they produce as impressive results as the original ones. These compatible toner cartridges are now available at Printerinkcartridges.ie and comes with 100% satisfaction guarantee. We offer black coloured toner cartridges here. Q. What connectivity options does the printer support? A. The printer supports Ethernet connection or USB port for connectivity. Q. Do you offer cyan colour Samsung SCX4725FN toner cartridges at your site? A. No, we only offer black colour toner cartridges, as the printer itself does not support colour printing. Q. Does the printer support Windows operating systems only? A. Apart from windows operating systems, the printer supports Apple Mac OS X 10.3 - 10.4, Linux, Red Hat Linux 9.0, SuSE Linux 9.0, SuSE Linux 9.2, SuSe Linux 8.2, Mandrake Linux 9.2 - 10.1, Red Hat Fedora Core 1-3, Red Hat Linux 8.0 . Q. Can I trust compatible Samsung SCX4725FN toner cartridges to work with my printer without any hassle? A. Absolutely! We assure you that you will not face any problem using our compatible Samsung SCX4725FN toner cartridges with your printer. All our toner cartridges are FSC tested and certified and will not invalidate your printer’s warranty. Q. Where can Samsung SCX4725FN printers ideally be used? A. Samsung SCX4725FN printers are all in one multifunction printers that come with printing, copying as well as scanning features. They have a monthly duty cycle of 10,000 pages and support high page yield toner cartridges. But, they do not support colour printing, making them most suitable for small offices. Q. How many pages can compatible Samsung SCX4725FN toner cartridges print? A. Our compatible Samsung SCX4725FN toner cartridges can print up to 3000 pages without having to be replaced. Q. How big is the Samsung SCX4725FN printer? A. Samsung SCX4725FN printers measure 43.68 cm in width, 37.33 cm in depth, 38.60 cm in height and weigh around 11.2 kg. Q. What all operating systems work with this printer? A. Samsung SCX4725FN printers work well with Windows, Mac OS as well as Linux. Q. What is the maximum print resolution of Samsung SCX4725FN printers? A. Samsung SCX4725FN printers can print up to a resolution of 1,200 x 1,200 dpi. Q. Can I print pages with the Samsung SCX4725FN printer via my mobile/tablet? A. Unfortunately, this printer does not support printing from mobile devices. You can only print via your computers with Samsung SCX4725FN printers. Q. I recently ordered a compatible Samsung SCX4725FN toner cartridge for my printer. But, I received a damaged product and I want a replacement. A. We apologise for the inconvenience caused. Please contact 048 308332211 or email us on info@printerinkcartridges.ie within 30 days of receiving your product. Keep your order details and invoice number ready and we will guide you through the process. Once, the faulty product is returned to us, we will arrange a replacement for you.